LiftPort Group, a company lead by former NASA researcher Michael Laine, is currently raising money for an exciting project: a space elevator on the moon. Men of science and imagination, like author Arthur C. Clark, have been discussing the idea of an elevator in space for over sixty years. Unfortunately, a host of complications, such as sheer distance of travel and floating space-debris, has always prevented this vision from developing past its incipient stages. However, Laine believes that his team has made a fundamental breakthrough that will “transform human civilization.” He plans to use the crowd-funding website Kickstarter to help generate money and garner enthusiasm for the project. Can Laine help us put an elevator in space? Read this fascinating Yahoo article and decide for yourself. As for SEES, we wish Laine and his team smooth sailing. 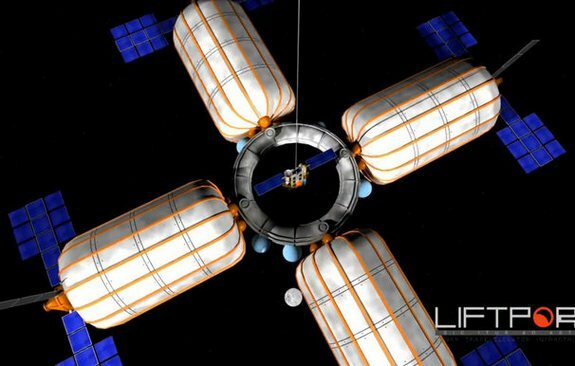 Part of the space elevator concept that LiftPort Group hopes can shuttle cargo down to the moon.